Hannah is the reason for Health, Home, & Happiness. If I had two typically developing children, I wouldn’t have done the whole GAPS journey, wouldn’t have so much to share with you on the internet, and most likely would be in a different line of work. She has special needs, she had autism but it was healed with GAPS, but she still has a global delay diagnosis and we’re still trying alternative treatments to heal her body as much as possible. Further reading: What is the GAPS Diet? I love that I have the internet available to share what I have learned with all of you. Today I’m going to talk about some things that outsiders might not realize about families that have a special needs child in them. Of course, this is all true for me, but won’t be true for all families. Before I had a child with special needs, there was so much about special needs families that I didn’t understand. And I know there is still tons I don’t understand- I have avoided the whole medically fragile/multiple hospital visits route, and I know I have readers there. I have some readers with multiple children with special needs, some with higher functioning children, some with lower. We all love our kids though, and we all have different strengths and challenges. 1. Parents of special needs children don’t come with any extra energy or more patience or understanding than anyone else. It feels dismissive to us when people say to us, ‘God will only give you what you can handle, He must have known you could handle it.’ Yes, we’re handling it, and we understand that you can’t imagine yourself in our shoes, but it doesn’t mean that it’s any easier for us than it would be for you. 2. Sometimes the emotional enormity of it is more exhausting than the physical aspect of having a special needs child. For children that need to be carried and lifted more, our muscles build up strength (I have some killer arms, since I still carry my low tone 47 lb 6-year-old fairly often when she gets tired), but emotionally every developmental change, school placement, choosing alternative treatments, supervising and making medical decisions are just as exhausting this year as they were last year. 3. The services that are available for children with special needs are difficult to navigate and often expensive. Before I had a SNC (special needs child) I assumed that if you had a SNC you just went and signed up for services, and someone told you exactly what to do, what you qualified for, and always acted in your child’s best interest. In some places that is true, but in most cases the parents have to really network with other parents to see what’s available, apply and re-apply for a correct diagnosis because the standard testing may or may not accurately reflect the child’s actual needs, and fight through red tape to get the child to be placed in the appropriate setting. And then do it all over again in 6-12 months when their developmental needs or school placement changes. 4. Paperwork and phone calls. Tons and tons of it, from everyone that even looks at our child, and many people who don’t even see our SNC, 10 pages of paperwork is often requested, they look at it for 5 minutes, and then realize we’re not the right fit. I keep an Excel document with the names, addresses, faxes, and phone numbers for everyone who currently and in the past has worked with my daughter and print it out before we see anyone. I call it her resume. Phone calls are hard, just like your children, our kids also act up while we’re on the phone. But as parents of SNC we’ve learned that it’s better to spend half an hour on the phone and make sure the specialist is actually something we need to go to before we drag the kids out for half the day for an appointment. 5. Our priorities change based on the entire family unit. Sometimes we are focusing on limiting screen time, sometimes we’re focused on a special diet, sometimes we’re focused on a behavior issue, sometimes it’s academic, sometimes it’s just maintaining the progress we’ve made so far because the family is going through some other transition like moving or having a new baby. It’s impossible for both the child and the parent to focus 100% on everything at once, so it may look like we’re changing our mind and jumping around a lot. Or we might be changing our mind and jumping around a lot. I promise, though, we’re not doing this for fun or because we’re bored- we’re trying to find what works best for our family. 6. We soon realize that we can’t give our kids 100% of us 100% of the time. Because parenting a SNC is so intense, we eventually realize that we have to take ‘me time’ to avoid burnout. I had the idea that as a parent I could keep pushing myself and eventually I’d get used to it. It took me 5 years, but eventually I learned that I have to take some time out and take a break from completely giving everything for my child. I come back refreshed, and much better able to a good job as a parent. It’s a good mental break too, to be somewhere where you’re not just known as a mom of a child with special needs. 7. It’s super hard to find qualified childcare for our kids! And we often need more of it than parents of typically developing children, since our kids require more of our attention when we are watching them and might not do well on standard errands. I’ve been fortunate to find amazing nannies to help me out part time, but because my child takes so much attention, I have to pay quite a bit more since the babysitter can’t take other children alongside mine, and she needs a higher wage than the high school girl down the street that could watch my typically-developing children just fine. The person providing childcare has to be experienced with special needs, on top of things, and has to have a personality that meshes with our child’s. 8. Our children’s behavior issues are not from poor parenting. Yes, consistency usually helps, but the way these children’s brains are wired and the sensory issues they deal with make them not respond to regular parenting techniques the way a typically developing child would. I’ve personally found that other parents have more grace with me when I put a medic alert bracelet on my daughter, it kind of gives them the heads up that she’s a SNC and I tend to avoid most of the glares at the playground for age-inappropriate meltdowns. We still have to go buy groceries, go to the bank, and get our car fixed just like everyone else – and sometimes plans can’t work around our children’s sensory issues, so they may be fussing in the store. It’s just how it is, there isn’t always an option to ‘do it when someone else is watching her’. Further reading: Are Sensory Issues Causing Your Child’s Meltdowns? 9. It doesn’t offend us if you ask us about special needs at all. Unless we’re newly diagnosed or still trying to figure it out ourselves, in that case it might be overwhelming. But to a family who has been ‘doing the special needs thing’ for a while, we’re happy to talk to you and help in any way we can. 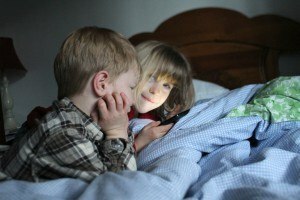 Many moms come up to me and want to ask if their toddler is showing signs of autism, or other special needs, and I’m always happy to talk about it with them (they’re usually not, and of course I’m not a medical professional but I’ve been around enough SNC that I’m fairly accurate on what’s developmentally appropriate and what’s not). 10. We want the best for our child, no matter the circumstances. That’s why we work so hard, it isn’t because we’re ashamed, it isn’t because we’re trying to change something that can’t change, or that we’re in denial, it’s because we want to make sure we’re doing everything possible for our child to reach their fullest potential. 10 tips to help you interact with our (special needs) family. The post You Know We Have a Special Needs Child, But Here are 10 Things We Might Not Have Told You appeared first on Health, Home, & Happiness.